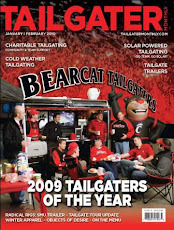 BearcatTailgater.com: Cats Chat with NeumannKy! It's a rough week to be a Bearcats Fan and The NeumannKy is feeling his hangover from the Bearcats loss in more than one way. Before I get to the game I want to officially declare the Holy Grail watch party as a raving success and I'm pretty sure the Bearcat Bombs were a huge success as well!!! Thank you to those fans who joined us for the game. We look forward to many more and bigger and better turnouts. 1) Brian Kelly doesn't like to run the ball. The CATS have had mixed success on the ground this season and yesterday it looked like BK wasn't interested in running the ball AT ALL. 2) Tony Pike wasn't ready to come back and Chazz Anderson isn't a guy that can lead this team to a Big East Championship. Who will start on Thursday??? 3) Maybe this team isn't as good as we thought??? Only time will tell, but I don't know how you come away from yesterdays game feeling confident about the rest of the schedule (save Syracuse). 4) The road to the Big East still runs through WVU. What a great win they had over Auburn. After this week, they look to be the most well rounded team in the conference. In the great words of Mark McGuire "I'm not here to talk about the past". ESPN comes to town this Thursday on the eve of Halloween to cover the CATS vs. the Bulls of South Florida. A big win against USF is exactly what the CATS need to get back on track. Unfortunately, with the uncertainty surrounding the UC QB position, this is looking like a tall order. The NeumannKy has faith the CATS can find a way to pull this one off 24-21. Rodgers hits a long field goal late in the game for the win. Video of the Week - A Tailgate Legend! !